Kim Griffin began repairing fiddles and guitars in 1976. In '77 he attended The School of Guitar Research and Design in Vermont, taught by Charles Fox and George Morris. Continuing on from there he built individual commissioned instruments, hammered dulcimers, banjos, mandolins as well as repairs and restorations. Currently Griffin works in a cozy studio in Greenwich NY, building guitars of 5 basic body styles, mandolins, banjos, and hammered dulcimers. He still devoted to the custom building strategy and resists the urge to build more than 6-8 at a time . "I will take the (critical) time, to match up the top with the bracing. We sometimes vary bracing pattern, size, and even species of woods depending on the characteristics of the top and the customers requisted tonal preferance. Each piece of wood has its own unique "fingerprint," both visually and sonicly". 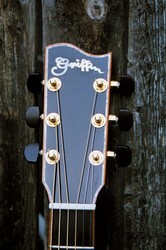 Griffin's entire thrust is to identify and accentuate that "fingerprint" to its full potential in each instrument. Also, there is that compromise that takes place when trying out factory built instruments. Does this sound familiar? "I like the feel of the neck but the tone isn't what I was hoping for" or "The tone is great but the neck isn't..." Griffin will custom build the neck, select the wood combinations of the players choice, provide custom inlay work. This insures that the costumer receives an instrument built without compromise, in which he or she has a voice in its design to be enjoyed for generations. Music...bluegrass old time traditional gospel, jazz, country; golf, dog training, hunting, fishing.